Photo (left-to-right): Wolfgang Faber (Alpen-Adria-Universität Klagenfurt, Austria), Theodoros Mitsikas (PhD Candidate, NTUA), Sofia Almpani (PhD Candidate, NTUA), Giovanni De Gasperis (University of L'Aquila, Italy). The RuleML+RR Challenge is one of the highlights of the Joint Conference on Rules and Reasoning (RuleML+RR) and seeks to provide competition among innovative rule-oriented applications, aimed at both the research and industrial side. This year’s competition took place in Luxembourg, on September 20, 2018, and was hosted by the 2nd International Joint Conference on Rules and Reasoning (RuleML+RR 2018, http://2018.ruleml-rr.org/), part of Luxembourg Logic for AI Summit (LuxLogAI 2018, https://luxlogai.uni.lu/). 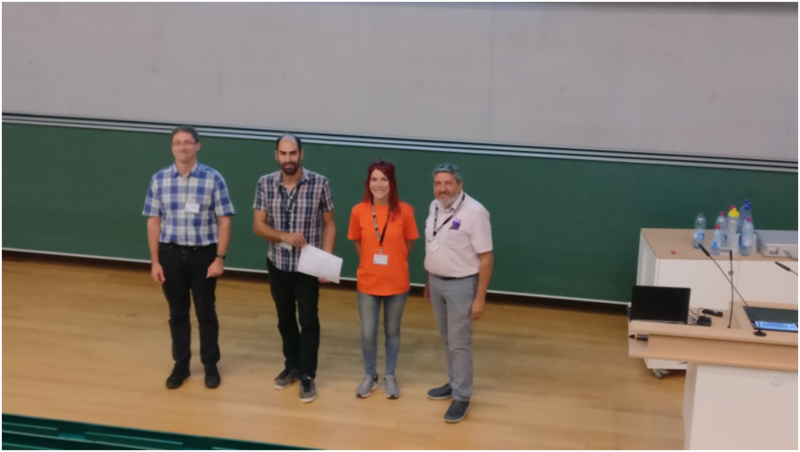 The Best Demo Award of the Rule Challenge 2018 was awarded to Theodoros Mitsikas (PhD Candidate, ECE NTUA), Sofia Almpani (PhD Candidate, ECE NTUA), Assistant Professor Petros Stefaneas, Professor Panayiotis Frangos and Dr Iakovos Ouranos for their presentation "Formalizing Air Traffic Control Regulations in PSOA RuleML". Abstract: The formalization of Air Traffic Control Regulations for the separation of aircraft during approach and departing phases is discussed. Our aim is to introduce rules in Positional-Slotted, Object-Applicative (PSOA) RuleML syntax that capture those regulations. This rulebase is combined with aircraft facts, resulting in a complete Knowledge Base for the computation of the required separation of aircraft. We provide examples of queries posed in the open-source PSOATransRun system and we show the capabilities and limitations of the Knowledge Base and PSOATransRun.